Discussion in 'Cars in General' started by GTPNewsWire, Apr 6, 2018. This article was published by Andrew Evans (@Famine) on April 6th, 2018 in the Cars category. hasslemoff and Danoff like this. The engine bay is cleaner than the rest of the car. You could have given it a wash for its photo call. I've always liked Alfas for there slightly quirky uniqueness that sets them apart for the mainstream. And, as mentioned, their interiors have always been particularly inviting. How's the 8 speed box go @Famine? You never remarked on it in the review. The Audi R8 beats it out by .1 I believe. You could have given it a wash for its photo call. That's largely because you never really notice that it's there. It just gets on with it - it never feels like it's just rowing through gears, like it has too many and can't really choose. Despite the lovely shift paddles, you might never even use them; I did for a couple of overtakes, but I'm sure it'd have been just as happy had I merely booted it. So, to talk about the elephant in the room... longevity? Because in about 3 years I am going to be new- (or very-lightly-used-) car shopping, and currently a Giulia is at the top of my list. We keep cars a long time - I only recently sold my 2003 325i, and I am currently driving my wife's ex-car, the Acura TSX / Euro Accord that we bought new in 2004. So if I buy an Alfa, I'm going to need 10+ years and 100,000+ miles out of it. About 6 months ago we bought my wife a new 2017 Volvo S60 T5 AWD. 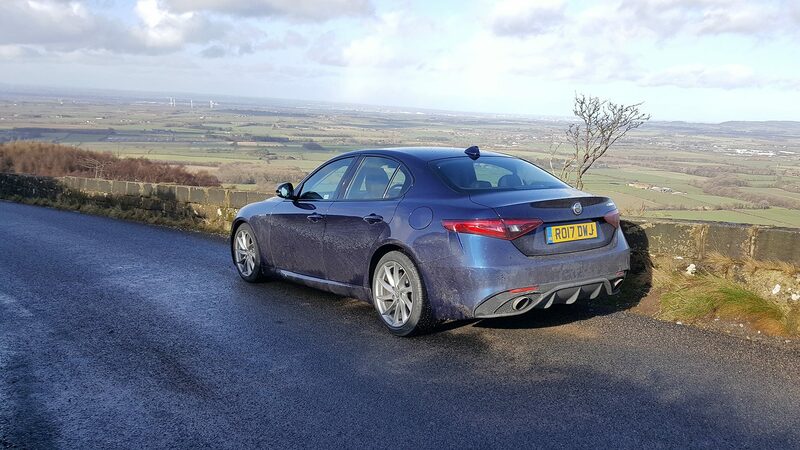 In theory it's similar to the Giulia in many ways, with the scales and dyno results both a bit in the Alfa's favor. The Volvo weighs in at around 3800 lbs for the AWD LWB (Inscription) version. It makes 240 hp at 5600 rpm but it makes almost 260 ft/lbs of torque from 1500 rpm on up, with a delivery curve that is nice and meaty. It also has an 8-speed automatic that has a normal and sport mode, which holds gears longer and shifts more firmly that normal mode. It has electric power steering, which has surprisingly decent feel, and weight that can be adjusted through the interface. Overall, it's a surprisingly interesting-to-drive car considering its maker and intended audience. I'm not exactly its intended audience, though I'm getting closer every day. I'd be putting the non-Veloce Giulia up against a 330i and possibly the SWB S60 (Dynamic) or V60. The 330i will be stretching the budget, but squarely in line with the S60/V60 R-design and the Veloce. So I really really hope that the Alfas prove themselves to be good long-termers. The standout of the interior for me. They're a tactile delight, and it actually feels like you're doing something by using them. The equivalents in the German trio all feel like buttons, with no real weight. It's always struck me as bizarre that most real-world cars have flappy paddles that feel like toys... compared to the literal toy wheel in my living room. P.S hope you turned the car around and went the other way instead of going back down the hill, you know it's more fun . That's a nice review @Famine . I was looking at potentially buying a Guila though not that spec, I think it's probably that few thousand more than we could do with spending right now. We're spending small fotunes on holidays and moved house just 6 months ago, so maybe not the right time for a £34k car, which was the cost of the models I spec'd up. More realistic alternatives are a new Mini 5 Door, which is the missues first choice, an Audi A3 Sportback which I would like or a BMW 2 Series, all smaller and a good few thousand cheaper than the Guilia. The Mini would be the cheepest but arguably the best spec'd and best performing car of the ones I spec'd up. All can be had in the low-mid £20k price range. We currently have a Cooper 5 Door which we're going to trade in before it needs it's second MOT and will have in the region of £16-17k to spend maximum without getting finance, which I do want to avoid. If I could stretch to a £30k+ car, I think the Gulia would be the one I'd be most drawn to, I also like the Jaguar XF's but they seem more "Corporate Sales Rep" than the Alfa to me. Anyway the car will mostly be used by my wife, she needs the car for work, I work a 15 min walk away so only really drive at the weekends so she should get a say. @SlipZtrEm I know what you mean, we had a Cooper S as a courtesy car for a day recently, that had the paddles, they were fun as a novelty but the feel wasn't right. They didn't make the drive more exciting or feel like that game any more control over leaving the car in full auto.